College of Medicine Dean Christopher T. Westfall, M.D., (left) and Department of Family and Preventive Medicine Chair Daniel Knight, M.D., place the endowment medallion on newly invested William Ventres, M.D. Sept. 19, 2018 | William “Bill” Ventres, M.D., M.A., assistant professor in the Department of Family and Preventive Medicine in the College of Medicine at the University of Arkansas for Medical Sciences (UAMS), was invested Sept. 17 as the holder of the Ben Saltzman, M.D., Distinguished Chair in Rural Family Medicine. Ventres, who joined UAMS in 2017, is a family physician and medical anthropologist with more than 30 years of clinical experience working with disadvantaged patients. He is known as a leader in developing family medicine internationally, researching doctor-patient communication using qualitative methods, and studying the social history of family medicine in the United States. He plans to encourage students and residents to practice in rural and underserved areas in Arkansas to improve health outcomes. William “Bill” Ventres, M.D., (second from left) with his wife, Estella, and daughter Cory, as well as (from left) College of Medicine Dean Christopher Westfall, M.D., Erick Messias, M.D., and Daniel Knight, M.D. An endowed chair is among the highest academic honors a university can bestow on a faculty member. A distinguished chair is a $1.5 million endowment established to support the educational, research and clinical activities of the chair holder who will lead future innovations in medicine and health care. Those named to a chair are among the most highly regarded scientists, physicians and professors in their fields. The chair is named in honor of Ben Saltzman, M.D., who has been called the father of rural family medicine in Arkansas. Saltzman joined UAMS in 1974 as the first professor and chair of the Department of Family and Community Medicine. During his seven-year tenure, he served as director of rural medicine development and the flexible internship program. In 1981, he was appointed director of the Arkansas Department of Health and served until his retirement in 1987. Saltzman died in 2003. Saltzman built the first hospital in Mountain Home and helped establish others across the state. He is remembered as a champion of rural health and an international leader in helping eradicate polio. Saltzman made health care more widely available and worked as a traveling doctor who owned a twin-engine plane for his work. Saltzman was past president of numerous statewide health organizations, including the Arkansas Lung Association, what is now The Arc Arkansas, the Arkansas division of the American Cancer Society and the Arkansas Board of Health. He served as chairman of the American Medical Association’s Council on Rural Health, as a member of the U.S. Department of Health and Human Services’ Community Health Project Review Committee, and as a member of the National Advisory Health Services Council. Ventres with his wife, Estella and daughter, Cory. Ventres was presented with a commemorative medallion by Westfall and Knight. He thanked Saltzman and recognized Julea Garner, M.D., the previous chair holder. Ventres reserved special thanks for his wife, Estella and his children, Roby and Cory, who were in attendance. Ventres received his medical degree from the University of Minnesota Medical School and completed his residency and fellowship training in family medicine at the University of Arizona College of Medicine in Tucson. 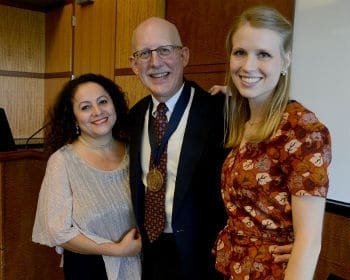 He has received two Core Fulbright U.S. Scholar awards and has taught family medicine residents at the National Experimental University of Táchira in San Cristobal, Venezuela, and public health students at the University of El Salvador in San Salvador. Prior to his arrival at UAMS, he was a research associate for five years in the Institute for Studies in History, Anthropology and Archeology at the University of El Salvador. Ventres has served as visiting professor at Nelson Mandela University in Port Elizabeth, South Africa, and scholar-in-residence at both the Brocher Institute in Geneva, Switzerland and the Institute for the Medical Humanities at the University of Texas Medical Branch at Galveston.